The first cinema presentation in Australia happened in October 1896 at the Athanaeum Hall in Melbourne. 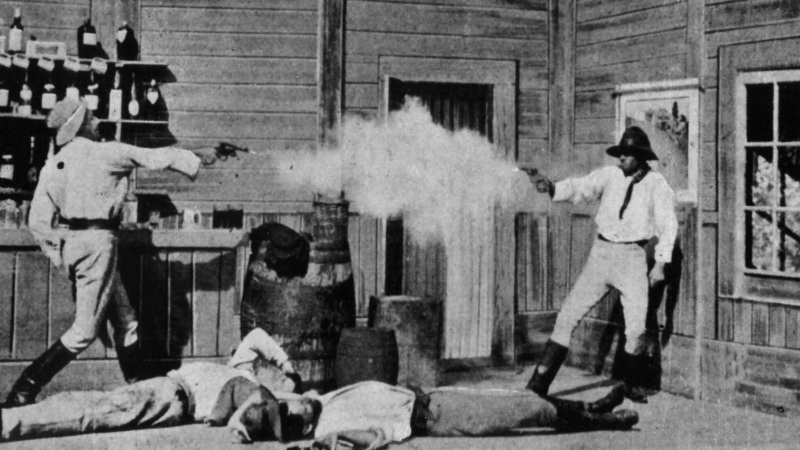 It was a short movie (of course), but while Australia and other movie producing countries around the world continued to make and show short movies, it was Australia that would produce the first full-length feature: The Story of the Kelly Gang (1906). Running for approximately sixty minutes, it was directed by Charles Tait, a concert, movie and theatrical entrepreneur, and featured several of his family in key roles. It was a major success, and was shown in New Zealand, Ireland and the UK (alas, only seventeen minutes of footage still survives). While the Athanaeum Hall continued to show movies, Melbourne was also the home of one of the world’s first movie studios, the Limelight Department, which was in use between 1897 and 1910 (and was overseen by the Salvation Army). It made a variety of movies of varying lengths, some three hundred in all, and was, for its time, the biggest producer of movies worldwide. It was responsible for a number of firsts: first feature length documentary, Inauguration of the Commonwealth (1901); first bushranging drama, Bushranging in North Queensland (1904); and first movie combining moving images, glass slides, oratory and music, Soldiers of the Cross (1900). As the Australian movie industry took off, the ensuing boom years of the 1910’s saw the industry flourish, with directors such as John Gavin, Alfred Roche, E.I. Cole and W.J. Lincoln leading the way (and even though some of their efforts may not have been as good as they’d hoped). In 1911, first-time director Raymond Longford made The Fatal Wedding, a melodrama that proved to be a huge success and which was well received critically. It was also the first Australian movie to claim two particular innovations: that it was the first to use interior sets, and that it featured the first ever close-up. Whether or not this is actually true, it reinforces the view that Australia – despite its distance from the rest of the world’s movie-making community – was forging ahead with new ideas and was creating a robust, popular industry that was the equal of the US, Italy and the UK in terms of movie production and exhibition. As the decade wore on, more and more movies were made and released, including The Sundowner (1911), Transported (1913), The Martyrdom of Nurse Cavell (1916), Australia’s Peril (1917), and the interestingly titled Does the Jazz Lead to Destruction (1919), but most titles are now considered lost. 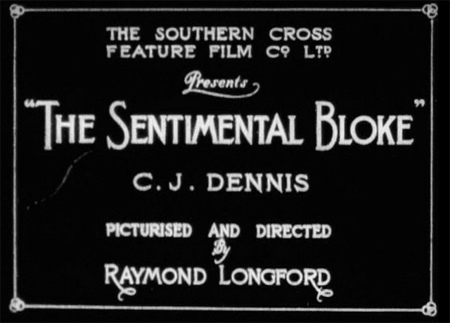 One movie that has survived, and was the subject of a restoration project in the early 2000’s, is Raymond Longford’s The Sentimental Bloke (1919), viewed as one of the best Australian movies of all time, and based on the poem The Songs of a Sentimental Bloke by C.J. Dennis. Here is a testament to the impressive development of the Australian movie industry, and an example of how advanced this island continent had become. Bill (Tauchert) is a larrikin, an uncultivated, mischievous man who behaves as if social conventions don’t apply to him. He drinks – usually with his best friend, Ginger Mick (Emery), and he gambles as well. When he’s caught in a raid on a gambling den, he’s sentenced to six months in gaol. When he gets out he vows to himself that he’ll give up his old life and walk the straight and narrow. He finds work at a market and avoids his old friends. One day he spies a young woman (Lyell) and is instantly smitten with her. But when he approaches her, and uses his usual slang terms to impress her, she rebuffs him. Chastened, and aware that he needs to improve his manners, Bill determines that if she should meet her again he will behave more responsibly. He learns that the young woman is called Doreen and that she works in a pickle factory, putting labels on the bottles. Through a friend who works there also, Bill arranges a meeting with her, and putting aside his usual way of talking, he shows her that he’s not as bad as she thought previously. They begin seeing each other, but when another man Bill calls the Stror ‘at Coot (Young) starts to pay attention to Doreen as well, his natural belligerence and anger cause him to warn the man off. However, the Stror ‘at Coot persists in seeing Doreen until Bill gets violent with him, a situation that Doreen is unhappy about. Knowing he’s skating on thin ice, but confused that defending his true love appears to be wrong, Bill assures Doreen that he will try harder. Eventually, after Bill has satisfied the concerns of Doreen’s mother (Reid), they marry and settle down together in their own home. But a chance encounter one night with Ginger Mick leads to Bill lapsing back into his old ways. He gambles away his money, and when he finally gets home in the early hours of the morning, he expects to be chastised for his foolishness. But the next morning brings a surprise, one that allows the couple to move on with their lives and in the fullness of time, to find peace and happiness. A huge success on its release, The Sentimental Bloke plays like a cross between Charles Dickens and an early Australian soap opera. It’s a charming, easily likeable movie, with a good central performance from Tauchert (who’d only made a couple of short movies before this), and tells its story in a direct, no frills way that makes it all the more enjoyable. In adapting Dennis’s work, Longford and his real life partner Lyell have kept the heart and soul of the poet’s work and translated it to the screen with surprising ease, even to the point of using Dennis’s prose for the intertitles (though some viewers may be put off by the use of colloquialisms and Aussie slang terms). There’s much to admire, from Tauchert’s naturalistic interpretation of Bill, to Lyell’s considered portrayal of Doreen. 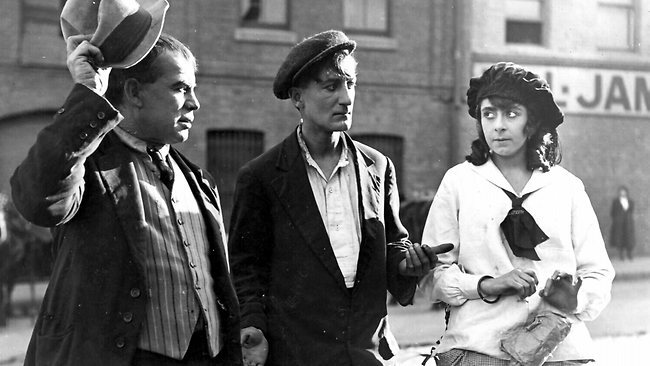 Their scenes together reflect Longford’s decision to eschew the usual melodramatic excesses of silent movie acting, and opt for a more realistic approach, leaving Bill and Doreen resembling people that audiences could actually identify with. Tauchert has a wonderfully expressive face (especially when Bill is showing confusion), and Lyell matches him with several moments of pained acceptance, as Doreen’s love for Bill wins out over her reservations about his behaviour. (Sadly, Lyell, who was very very talented, and regarded as Australia’s first movie star, died in 1925 from tuberculosis.) Elsewhere, Emery and Reid provide solid support, but Longford keeps the focus on Bill and Doreen, and rightly so. Their relationship, with its ups and downs and unwavering commitment to each other, is shown without the need for undue or unnecessary emphasis, and is all the more effective for it. What arises from all this is a great deal of humour to offset the pathos and muted drama. A highlight is a visit to the theatre to see a production of Romeo and Juliet (not something that Bill is too keen on at first). As the couple become wrapped up in the tragedy of Shakespeare’s young lovers, each twist and turn of the story sees them more and more emotionally invested, until the moment when Romeo slays Tybalt and Bill shouts out “Put in the boot!” The movie is stuffed with winning moments like that one, and each adds to the richness of the material. The movie is also beautifully shot by Arthur Higgins. He was the DoP on The Fatal Wedding, and would work on this movie’s sequel, Ginger Mick (1920). He shows a firm grasp of lighting and composition, and the outdoor sequences have a freshness and vitality about them that few other cinematographers of the period could manage to achieve. It’s a shame that so many of the other movies he shot have since been lost – on this evidence he was exceptionally talented and deserves to be more widely known. Following its release, The Sentimental Bloke was a success in the UK and Ireland, but not in the US because Dennis’s prose was found to be too difficult to understand. Despite the movie being recut and the intertitles changed, and being called The Story of a Tough Guy, it was quickly withdrawn from distribution. In the Fifties, a fire at a Melbourne movie library resulted in the destruction of all but two boxes of movie negatives. Fortunately, The Sentimental Bloke was saved, and following a transfer of the 35mm nitrate positive to 16mm acetate stock, it was shown to great acclaim at the 1955 Sydney Film Festival (ironically, Longford wasn’t invited to attend as the organisers were unaware he was still alive; he died in 1959). But that wasn’t the end of the movie’s journey. In 1973 an original 35mm negative was discovered at a Film Archive in Rochester, New York. Even though it was a copy of the American version, the quality was better than any Australian copies (it had also been mislabelled The Sentimental Blonde). And in 2000, Australia’s National Film and Sound Archive embarked on a restoration project that included restoring the original colour tinting as much as possible. The results were shown at the 2004 Sydney Film Festival to further acclaim, proving that Longford and Lyell’s efforts all those years ago will continue to be appreciated – and rightly so. Rating: 9/10 – a bona fide classic that still stands the test of time, The Sentimental Bloke is Australian silent cinema at its finest: dramatic, funny, emotionally earnest, and heartwarming; as one of the few movies to survive (relatively) intact from the period, it should be required viewing for anyone interested in silent cinema, or just because it’s a beautiful story beautifully told.